I am not ashamed to admit that I have a major addiction problem. Stan’s Donuts, to be precise. I’ve always thought that I would be craving for Krispy Kreme donuts here in the US, but noooo…. gimme Stan’s Donuts any day now. Apparently Stan’s Donuts is a local brand whereas Krispy Kreme is more commercialized, but in any case, Stan’s Donuts is closer to where I live, and yup, I am totally hooked now. My hubby and I started by buying just two donuts each of the glazed and the sugar varieties, but now we have started buying more and more. 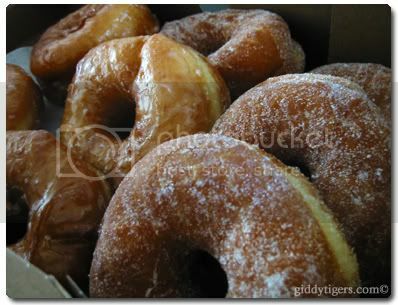 By the way, I only ever like the glazed and sugar kinds. They do have the fancy-schmancy kinds with decorations and whatnot, but those don’t make me salivate. Most of the time when we stop by the obscure little shop to get our cravings satisfied, we would be told they were out of glazed or sugar donuts. Yup, they are THAT popular. So who in their right mind would get 10 donuts, you tell me? And just in case you were wondering, of course I went back to claim my 2 donuts that day! And just last weekend, my hubby and I went to get a dozen donuts, but we asked to pack 8 donuts in the box and 4 in a paper bag (to give to someone). The guy manning the counter wanted to charge us $8.40, just because all the donuts weren’t in the box. Silly reasoning! We still paid $7.25, but we were told that it was their policy to charge the non-discounted price if all donuts weren’t in the box. Isn’t that ridiculous? The Giddy Tigress says: Hah! I can only wish! How come never get donuts for us when u are here….not fair! Hmm…..i like the 40cent donuts sold by Malays in the pasar tani. I got cheapo taste! The Giddy Tigress says: Are those the really sweet ones?